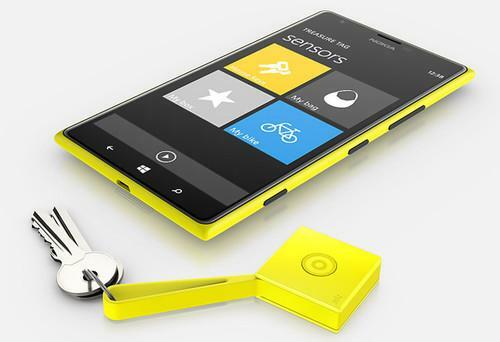 Nokia's Treasure Tag helps users find misplaced keys. Nokia has unveiled its Treasure Tag device, which can help people use their smartphones to find valuables like keys or a bag by putting a tag on them. The tags, which come with an accompanying app, will be compatible with Nokia Lumia phones with the Black software update, Nokia said Wednesday. There will also be third-party applications for Android and iOS devices available, the company said. Users can have up to four different tags simultaneously connected to their Lumia, and each tag can be placed on the start screen as a Live Tile. When users inadvertently leave behind their smartphone or keys, both will emit a loud tone to alert them, according to Nokia. The alert can also be prompted using the app, which will help users locate lost items on a map, as well, Nokia said. Pairing can be done using NFC or from the Bluetooth settings menu. A tag is deactivated with a long press on its only button. The accessory measures 30 millimeters by 30 mm by 10 mm and weighs 13 grams. The tags will cost about US$30 when they start shipping in April around the world, and users can choose between cyan, yellow, white and black colors. Nokia also promises a battery life of up to six months for the device. Nokia started distributing the Black update last month. It includes features such as app folders and an updated version of Glance screen, which lets users see notifications from up to five apps on the lock screen. Bluetooth Low Energy has been enabled across the full range of Lumias and all models can now get the new Camera app.